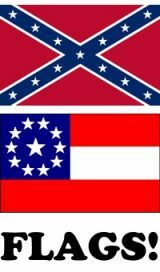 Federal judge Jean Hamilton upheld the right of the Farmington School District to suspend former student Bryce Archambo for his refusal to remove clothing bearing the Confederate battle flag. Bryce Archambo, then 14, was suspended from Farmington High School for a day Sept. 28 after a physical education teacher told school administrators he was offended by his clothing, which included the Confederate flag and slogan, â€œRebel Pride.â€ The Archambo family then began home-schooling the student and hired lawyer Robert Herman of St. Louis to challenge the suspension. Archambo has said his decision to wear the Confederate flag clothing was not racially motivated. Instead, the former freshman said he wore the clothing as a symbol of his southern heritage. Note: An appeal is likely to come and many of Mr. Herman’s cases have been won through the appeals process. This entry was posted on Saturday, August 25th, 2007 at 6:20 pm and is filed under Uncategorized. You can follow any responses to this entry through the RSS 2.0 feed. Responses are currently closed, but you can trackback from your own site.